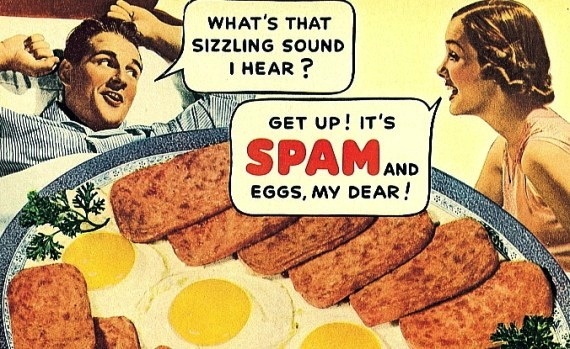 Leave a Comment on Does Spam really look like prison food? Do foodies eat Spam? This foodie does and I admit to being a little ashamed of this. After all spam is nothing more than canned, spiced, precooked meat made mostly of ham and pork and so many people make fun of spam-eaters. I had not eaten Spam in years but the other day while watching TV, Anthony Bourdain was cooking it and this rekindled memories of childhood where special breakfasts featured spam on the weekends. When I opened the can and showed the contents to my kids they said. “We are not eating that, it looks like prison food.” I just smiled and proceeded to cook, secure in the knowledge that they would love my version of Spam and Eggs. ½ of an onion, diced or sliced. Take the Spam and cut it in slices or cubes, pan-fry until it is slightly browned and set aside. Slightly brown the onion in the pan in low heat and prepare the eggs in the meantime. Break the eggs into a container and add a little cream and a dash of curry. Stir with a fork until the mixture is the color of a lemon. Add the egg mixture to the onions and cook gently. When almost set, add the Spam and cook until done. After tasting this, my kids are Spam fans.